We've all been there: desperate for the toilet when it seems there's no such thing for miles. And when you do find a public 'convenience' it's often anything but. Public toilets the world over can range from disgusting to downright terrifying, but we're glad to report that there are some amazing examples of beautifully and thoughtfully designed public toilets, small architectural marvels whose brilliant design inspires respect in those who use them (or so you'd hope). In areas of natural beauty such as parks, toilets can often be a bit of an unfortunate necessity. Design solutions vary, from making toilets that look like quaint little cottages to ones that are hidden by trees or underground. 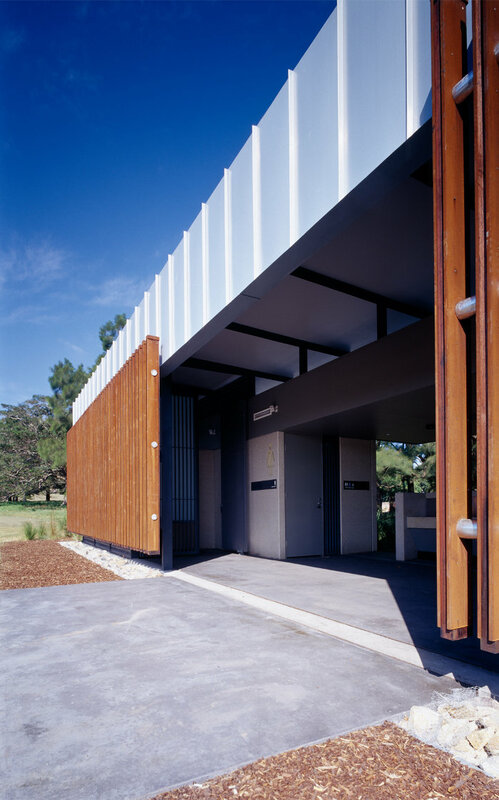 But when it came to designing public toilets for Centennial Park in Sidney, Lahz Nimmo Architects decided to take a more honest approach, relying on the principles of architecture to create a simple, modern building that doesn't detract from the natural beauty of the parkland. The brief was to design a generic building which could be built throughout the Park with minimal adaptation. 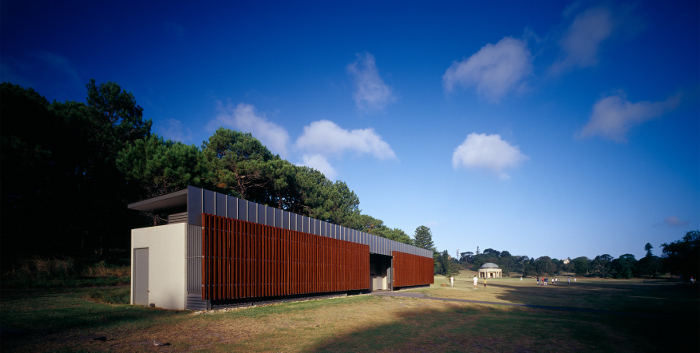 The male and female toilets are divided into two pavilions linked by a continuous roof. The space created between the pavilions acts as a central entry point to the amenities. The hand washbasins take the form of a polished concrete trough and are located in this central communal space providing a unique experience for the user to wash their hands and look out to the Park. This external communal room also provides a reassuring sense of security, surveillance and shelter during rain. 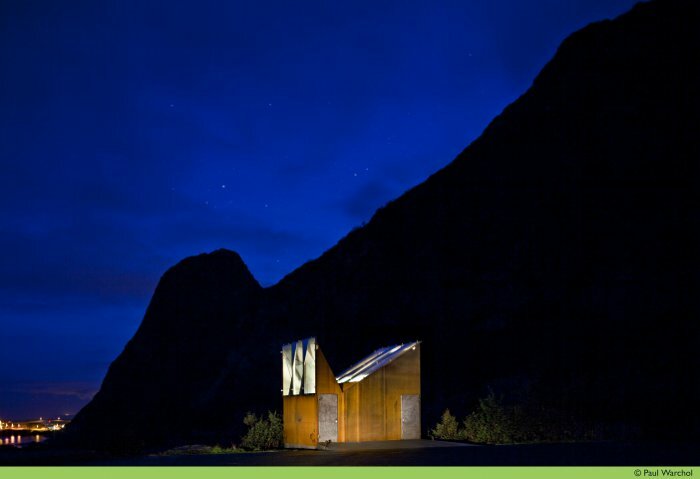 Along with giving his projects names such as Bubbletecture M and Springtechture H to refer to the formal and structural features of his work, Japanese Architect Shuhei Endo is known for the originality of his buildings, and his innovative use workaday materials such as corrugated sheet-metal. 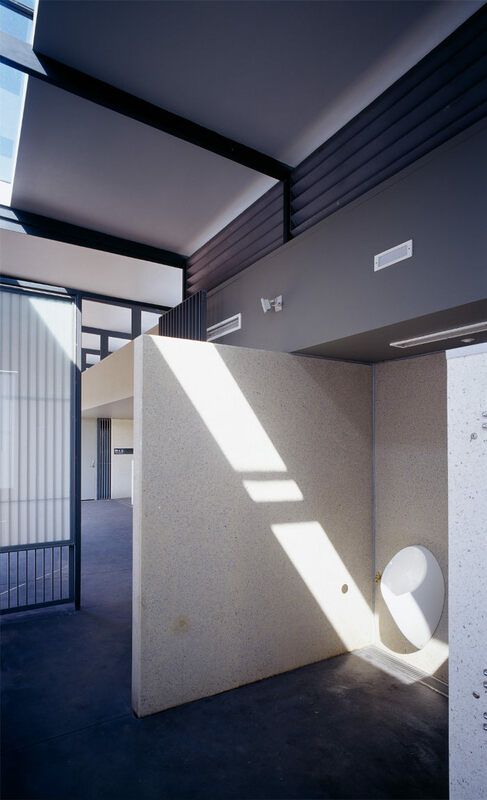 A perfect example (though perhaps more low-key than many of his projects) is Graviculture M, a ticket booth and toilet pavilion for a tennis court in Miki-city's Hyogo prefecture. 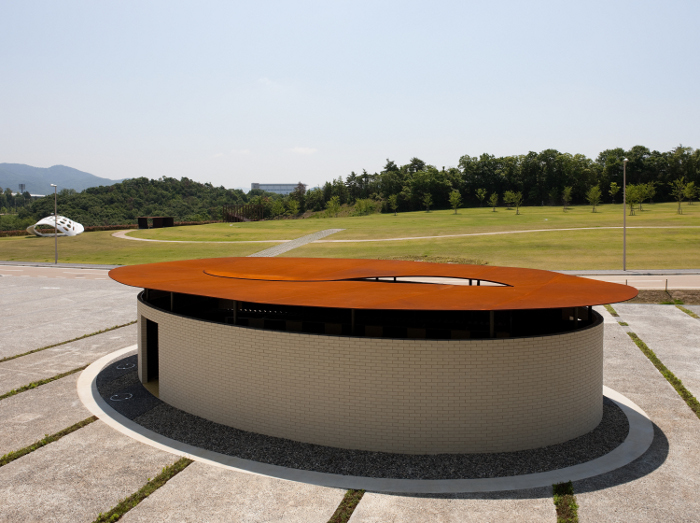 The facility is contained within an oval ring made of bricks, which stands separately from the Corten steel roof and columns. The interior is as organic in form as the exterior, with partitions and fixtures conforming to the flows of the building's shape. And while rectilinear elements are set against the curves of the building, their own design evokes the curvilinear theme through arches and rounded corners. Perhaps the most unusual-looking toilets on our list, Kumutoto, in Wellington, New Zealand have been described as looking like some kind of armour-plated insect or robotic dinosaur. But as well making a strong style statement, these loos are also designed to be practical. 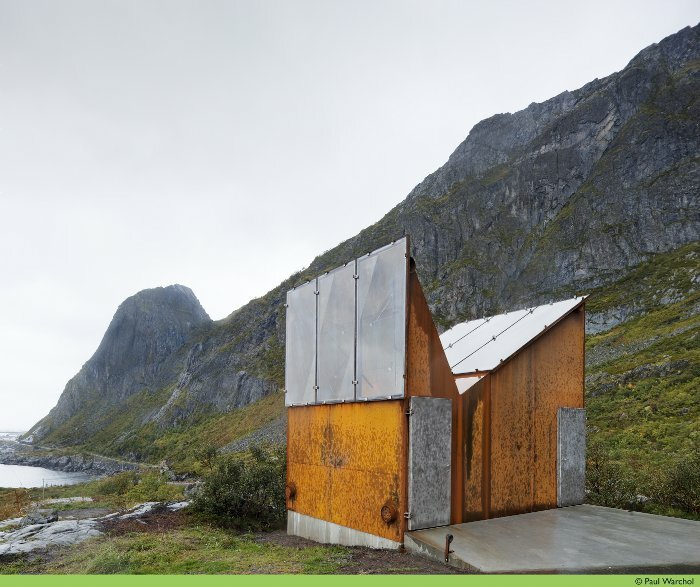 Built to replace a toilet that had been blown off its foundations by the wind, the roadside reststop in Akkarvikodden is on Lofoten, one of Norway's beautiful and wild National Tourist Routes. Given the fate of its predecessor, the new toilet needed to be solid and durable. 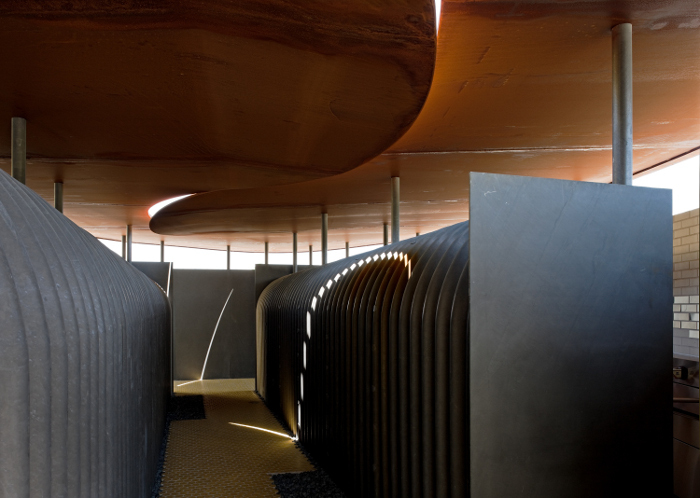 The building is made of 10-12 mm sheets of structural corten steel, which was welded together on site. Two large glass openings give views of the sky and the reflected horizon. 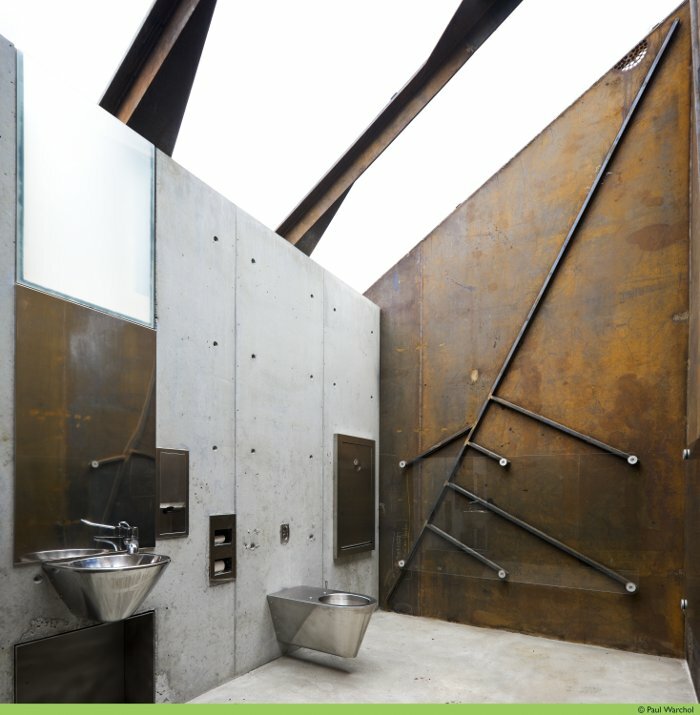 The surfaces that come into contact with the visitors - the toilet itself and sink - are made of stainless steel or covered in clear glass to prevent rust staining.